For over two decades, Chris Bianez (pronounced like "Be Honest") has been delighting audiences of all ages with his keynote addresses and workshops and has inspired hundreds of thousands of individuals to pursue their goals and objectives despite challenges and difficulties. Chris Bianez’ dream to become a police officer, fueled by his desire to make the world a better place by ridding it of drugs, was shattered upon discovering his parents were drug addicts. He was crushed. Refusing to live around drugs and all their negative affects, Chris ran away from home with someone whom he mistakingly believed to be a trusted young adult. When the FBI located them six months later, the young man harboring Chris was released with no charges while Chris was jailed for leaving his home. Upon his release, the abusive man relentlessly stalked and threatened the adolescent until Chris returned to live with him. Six heart-breaking years followed. Despite these challenges Bianez set and achieved goals. In high school, as a springboard diver, he broke all school and league records and went on to be a three-year undefeated champion in the San Antonio League. In his senior year, Chris won the Southern California State Gymnastics Championships on the horizontal bar. Bianez received a double athletic scholarship for gymnastics and diving and went on to attend college. He received his B.S. in Human Relations and Business. In 1997, Chris achieved his childhood dream when he became a police officer. Now he inspires others to achieve their goals. 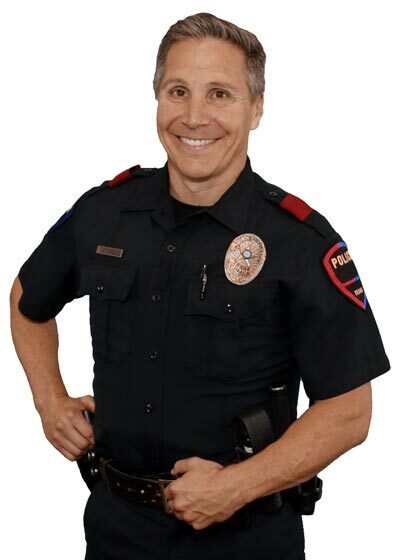 Officer Bianez began his law enforcement career with the Plano Police Department in April 1997. During his tenure he has worked the following assignments: patrol, D.A.R.E.®, and is currently assigned to the Crime Prevention Unit. Chris’ full-time assignment is safety education, helping organizations protect their people and property. Bianez is passionate about providing people with the educational tools and strategies they need to help them avoid being victims of crime. Officer Bianez provides keynote speeches, workshops, and webinars on a variety of MOTIVATIONAL and SAFETY topics.